Who knew “Amazing Grace” had such a groove hidden in it for all these years? I don’t think it would be an exaggeration to say that everyone has heard “Amazing Grace” at some point in their life. Whether it’s been during a church service, a funeral, Star Trek II or last week’s Lost preview, the melody has become ingrained in the human psyche. It only takes those few opening notes to recognize it and to be gripped by it. Long ago “Amazing Grace” became the “go to” song to use whenever there is a death or a tragedy or anything else that is due solemn reflection. I must admit, it works pretty well too. Bonus points if it’s played on bagpipes. However, if you look at the circumstances behind the hymn, I’m not sure that a “hallowed remembrance” alone was the author’s primary intention. John Newton, a slave ship captain turned minister, penned the poem “Faith’s Review And Expectation” in 1772 and it eventually became known as “Amazing Grace” due to it’s opening line. As if dealing in human trafficking weren’t shameful enough, he was also notoriously known to be one of the most obscene and profane men among sailors, which is saying a lot! But like any man who has been given a taste of redemption, he changed his life into one of ministry and service. When he wrote, “Amazing grace, how sweet the sound that saved a wretch like me,” he truly understood the depth of both his wretchedness and God’s grace. Although I didn’t exactly understand the full weight of this concept when I sang it as a kid, my adult eyes are being opened more and more every day to both sides of the equation. Which brings me to my point that I don’t think it should just be a somber, meditative song. It should be a joyful, upbeat acknowledgment of what we’ve been brought out of and what we have been adopted in to. Sandra McCracken really captures this rejoicing spirit in “Faith’s Review & Expectation” off her newest hymns project, In Feast Or Fallow. It’s hard to listen to her version of the age old classic without smiling, singing along and even dancing a little bit. The timeless words feel somehow brand new as they are sung over a happy backdrop of acoustic guitar, drums, tambourine, hand claps, organ, ukulele and a bass line that would make Paul McCartney proud. Sandra proves that you don’t have to have written the lyrics to a song to put your own stamp on it as she uses the music to magnify the gladness found in the lyrics and really draws out the writer’s emphasis on grace and redemption. This is by far my favorite version of the hymn and has gotten me really excited for the whole project. 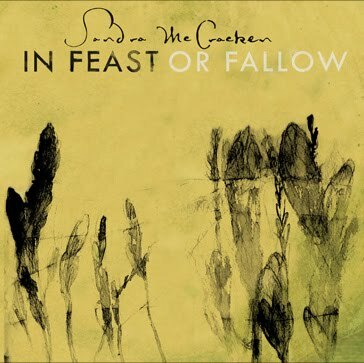 In Feast Or Fallow will be released on April 27 and is currently available for pre-order on her website and on www.newoldhymns.com. On this website you can also stream each song from the new release and from her last hymns project, The Builder And The Architect, get her thoughts on every track off both releases and find additional articles and links regarding hymns and the current community of hymn writers. I highly recommend you spend some time on this website because it’s not everyday that an artist offers so many resources and opens themselves up about their art like Sandra does.